We get literally (as they would say on the TV show Archer, literally literally and not figuratively literally) hundreds of paper bills to pay each month in our business. We can barely keep up just with paying them all, much less vetting every one. Which is what scam artist marketers count on when they craft fake bills they spam to businesses in hopes that some percentage, in their hustle and bustle, will pay the bills without knowing they are fraudulent. These letters really, really tick me off. They are sent by people who apparently cannot sell a product or service on its own merits and so must trick harried business people into accidentally sending them money. I get these most frequently from companies that send me letters that look just like a government agency requiring yet another fee (the corporate minutes fraud). So here is the most recent bill my accounts payable person questioned and put on my desk. It is from a company called US Telecom, and despite the remission address on the letter it is apparently based in California. You can click to enlarge the letter -- it is in very high resolution, which we will need to find the small print that they use to try to cover their butts. 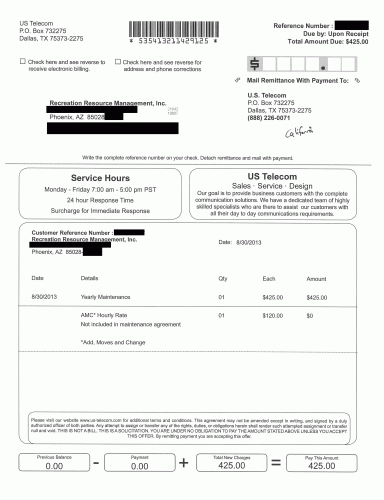 Does this look like a regular bill to you for some service we have contracted for? It did to me. Note the "Due upon Receipt" at the top, the calculation below with previous balance and new balance and "pay this amount." No reasonable person in this country would say it looks like anything but an invoice for service received. But this is not a bill. It is a solicitation for services. If you send the money, then you are committed. And by the way, per the terms below, once the agreement is in place, it cannot be terminated or amended (or likely refunded) without a signature from both parties, which means only if they approve it. If they don't, congrats, you are stuck in this contract. I have no idea if you actually paid, whether you would receive any services or not. Since they priced this service without even knowing what assets I have that would be serviced (note no equipment or equipment location is listed in the bill, the first "tell" to me this was a fraud) I am not sure how they would ever provide any service. (we were really saved by Quickbooks on this one, because my payables person flags any bill from a vendor not set up in our system). They attempt to cover themselves, in the same way the corporate minutes scamsters do, with the small print in the last two lines at the bottom. Can't read it? LOL, I could not read it myself, even full size, without my glasses. You can click through if you wish to see it on the high rez version. But it says that it is not a bill, it is a solicitation, and that I am under no obligation to pay unless I accept the offer, which I do by paying. But by the language, once paid, I have accepted the offer and cannot get out of it without a signature from an authorized officer of their company. I bet that would be easy to get. That last fine print may keep them out of jail or even let them sleep at night, but no legitimate business with a valuable product sells its services this way. Update: Apparently there is a legitimate US Telecom and they are understandably pissed. They have set up a page on this billing fraud, and apparently the Attorneys General in a number of states are investigating. Update #2: Talk about waddling in late on a story! These guys' registered corporate name is UST Development, run by a guy named David Bell. Ken White of Popehat has been on these guys for years. LOL, I even linked Ken's post a while back. You sleazy folks out there can f*ck with me all you want but you do not want to mess with Ken White. Update #3: Good God, Ken did 14 posts on these guys. Enjoy.